Advent is the season before Christmas during which we anticipate the Second Coming of our Lord and Savior Jesus Christ. It is in this Second Coming that He will judge the earth and raise all the dead. Those who have faith will be given their reward in heaver and live with Him eternally. The color for Advent is blue, which suggests hope for us while we wait. Note: Wednesday services are on December 5th, 12th, and 19th. New Year’s Eve Worship with Holy Communion – 7:00pm. The Advent Wreath contains a number of symbols. The evergreen wreath symbolizes eternal life in Christ. The candles are symbolic of Jesus Christ, the Light of the World. 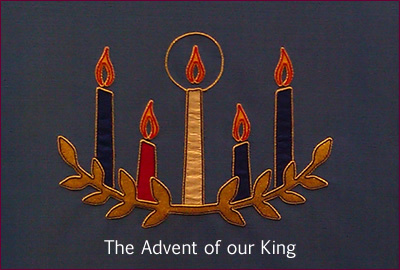 The act of lighting more candles each week anticipates the imminent coming of Christ. Christ Candle is lit on Christmas Eve. This central candle signifies that the Light of the World, Jesus, has come.